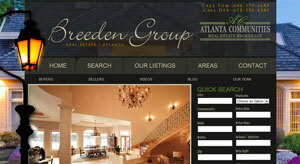 This month we’re showcasing tombreedenhomes.com, the Atlanta real estate website of Tom Breeden of the Breeden Group. 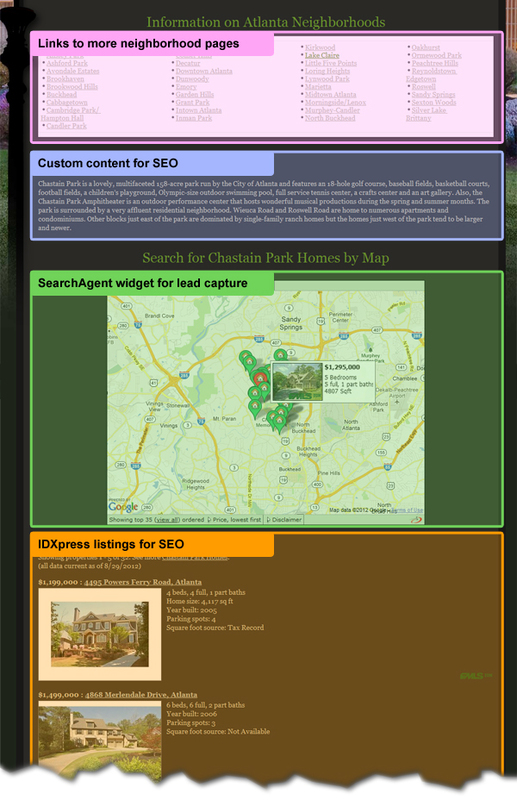 Created by Cherie Young and the pros over at Online Marketing Strategies, Tom’s site integrates widgets and modules from our IDX plugin and mapping IDX in a beautiful website that’s a great inspiration for real estate agents looking to build a classy, dramatic web presence. Buyers are coming to your real estate site to find homes, so it’s important to include buttons to your MLS search and other IDX links in your nav bar. At the same time, you want buyers and sellers (and search engines) to know that your site has great content on how the market’s doing, how to finance a home and more – without pulling focus away from your IDX. Tom’s site tackles this issue with dual nav bars: one large bar across the top of the site with IDX search-related buttons like his property search and area pages, and a second smaller bar just below that with buttons to read articles on buying, selling or read his blog or more about his team. IDX-related buttons are large and on top, with smaller buttons for additional pages below. This double nav bar doesn’t take up much more room than a single navigation bar, and really helps visitors focus on the most important links (like searching for homes) while still providing easy access to the resources your site provides. IDX filtering via drop down menus. Hovering over the Search button in Tom’s navigation bar offers drop down options that make one-click searching super easy. Users just hover over Search to see a sub menu of cities, then hover over a city name to see a sub menu of price ranges, then click on any price range to jump to listings in the area and price range they’re looking for. This search-via-nav-bar is one of the ways you can provide visitors quick access to lots of custom IDX search links in an intuitive way that won’t clutter your site. IDX widgets from his sidebar. Ben is using 3 IDX widgets in his sidebar, which guarantees visitors will see live IDX listings no matter what page of his site they land on. His sidebar showcases listings via an animated photo slideshow, a detailed list and an interactive map, all of which lead visitors to either a page of his IDX plugin or his mapping IDX search. We always talk about this, but it’s important to remember that you can’t control what page of your site your visitors will land on. Sure, many will come to your site through your home page, but if you are optimizing your pages, most of your traffic will come to your site from some random listing page or blog post you put up. As a result, you want to make sure you have a search widget (or two or three) or other IDX component on each page to ensure visitors who stumble on any page of your site can eventually end up registering as a new lead on your IDX search. 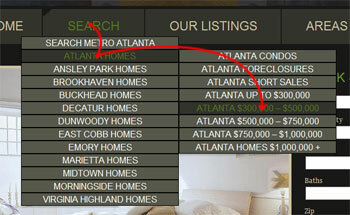 Ben’s Atlanta Neighborhoods page includes our framed mapping IDX search for general MLS searching plus a huge list of links to pre-filtered search pages for each of the Atlanta neighborhoods he serves. Visitors can access both the do-it-yourself search option via the IDX map or they click on any neighborhood to jump straight to listings in a certain area. Here’s the crazy thing: each link goes to a custom page Ben created for that neighborhood. His link for Chastain Park, for example, includes a little verbiage about the neighborhood, then a mini map search for the neighborhood (using a SearchAgent widget) followed by a list of the latest Chastain Park IDX listings (using dsIDXpress shortcode). Both the dsIDXpress shortcode and the custom verbiage contain SEO rich content, helping Ben get search engine ranking for both individual neighborhood pages and his main “directory” Atlanta Neighborhoods page. Breakdown of neighborhood page that combines SEO, IDX, and lead capture elements. An “Email Me New Listings” link opens up Ben’s mapping IDX with his registration form pre-loaded. It basically lets people know that if they register, Ben can start sending them new MLS listings via email. This kind of IDX registration page is easy to setup, but it’s his call to action language that makes it unique. Check out Tom’s site at http://tombreedenhomes.com for more ideas and inspiration. If you see something you like and want help re-creating for your site, post in the comments below and we’ll see what we can do to help!